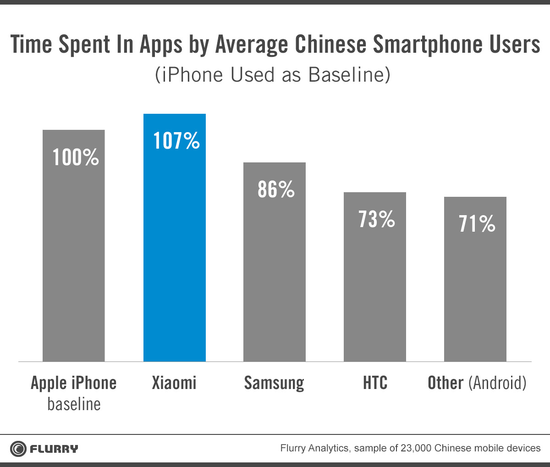 Flurry just posted some interesting data comparing Xiaomi's users to those of the iPhone and other Android smartphones. We already know that Xiaomi's users download roughly twice as many apps as iPhone and Android users, but now we also have comparative data on engagement and user demographics. This data paints a picture that is very different from the popular narrative surrounding Xiaomi, i.e. it only caters to low-end, price sensitive customers. While the engagement data is interesting, it merely confirms what we've already measured. 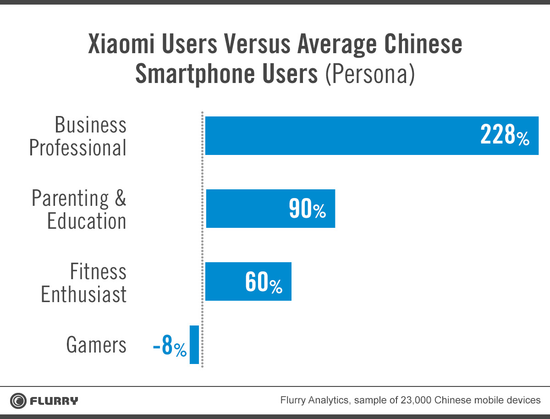 The most intriguing part of Flurry's study was their data on Xiaomi's user demographics -- the chart below in particular. Flurry says that Xiaomi's users "over-index on the business professional persona" by a huge margin. Logically speaking, this should be the core market for premium vendors. This is counter-intuitive to most observers -- why would premium customers use a device that was sold at cost? The problem here lies in the assumed definition of market segmentation -- real market segments are not based on price, but on usage. Segmenting the market by price would lead one to assume that Xiaomi could only compete with other Android vendors and is no threat to premium vendors. But as this data shows, Xiaomi already seems to cater to premium customers. Even more importantly, their services-oriented business model compels them to focus on premium customers, i.e. those with "high engagement potential". Of course, they can only make a meaningful impact on the premium market if they scale geographically -- so far, Xiaomi seems to be on track.